Looking to draw more customers for your business? Want to make it easier for potential customers to find your website? Though there are lots of different factors at play, one important thing you should be paying attention to is reviews. Reviews are an important factor in Google’s search algorithm. When businesses use reviews properly, they can increase their visibility in search engines and attract new customers. 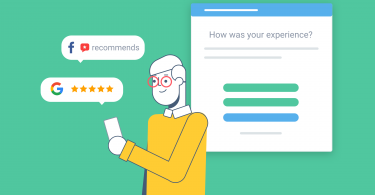 By the time you reach the end of this guide, we hope you will have a better understanding of the impact customer reviews have on your search ranking and walk away with some easy-to-implement tips about how to boost your business’s SEO strategy. Today, the marketing and sales departments in businesses all around the country are facing a crisis. A recent survey by Hubspot ranked the amount of trust Americans had for different professions. At the top of the list were firefighters and teachers. At the bottom of the list were salespeople and marketers with 1% and 0% respectively. This study has huge implications. Nobody would buy a product from a person or organization they don’t trust. That means that lots of the resources that businesses are pouring into marketing and sales are wasted. Businesses need to meet customers where they are. So, if customers aren’t listening to your marketing team, who are they listening to? The answer is other customers. 92% of customers consult online reviews before making a purchase decision. Though trust in sales and marketing has eroded, customers trust reviews. If you’re a business owner, you shouldn’t have to also become a digital marketing guru. You just need to be able to empower customers and have them spread the word about your business. To do this, you need to take advantage of online reviews. It’s not just customers that trust reviews. When customers search for the best local businesses near them, Google aims to give them the best results. To do this, Google takes into account the same factors that customers take into account to determine a business’s trustworthiness. Since customers trust reviews, search engines do too. Let’s talk about how reviews can help you when potential customers search for local businesses. Local SEO is the process of optimizing how your business appears online so it can appear on top of relevant search queries. For example, imagine being the owner of a barber shop. You want to be the first result when customers in your area search for “barbers near me”. Local SEO is what you do to accomplish this goal. Nowadays, optimizing for local search is becoming more and more difficult. For a business to maximize visibility to customers, they have to appear on the first page of search engines. According to Moz, the first page of Google gets 71% of all clicks. If that wasn’t tough enough, page 1 is now smaller than ever. There are now more mobile searches than desktop searches. 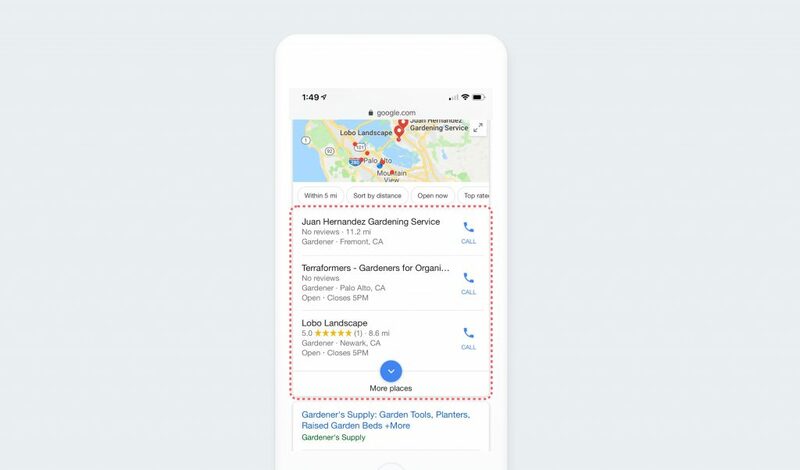 On mobile, customers typically can only see the top three businesses on local search, also known as the “local pack results”. Customers typically pick from the local pack results and don’t scroll further. In order to capture customers searching on mobile, being part of the local pack is essential. Google uses several different review signals in order to determine search ranking. Your overall star rating isn’t the only thing that leads to a high rank. The following review signals are considered so, keep all of this in mind when you’re trying to optimize your business for search engines. Make sure you have reviews from different sources. There are hundreds of different review websites on the Internet. Though you don’t need to have a hundred reviews on each, you don’t want to have all of your reviews on just Google or just Facebook either. Try getting reviews on sites that are specific to your industry such as Healthgrades (Healthcare), Angie’s List (Home Services) and Cars.com (Automotive). The more reviews you have, the better your chances of ranking high. Make sure that you are getting lots of reviews from customers. Most people feel comfortable with businesses that have at least 7-10 reviews. More is better. Be sure that you are getting a constant stream of new reviews. Having a lot of reviews from a year ago is great. Having lots of reviews coming in regularly is better. Plus, customers like recent reviews too. According to Search Engine Journal, 85% of customers believe that reviews written more than three months ago are no longer relevant. In this section, we’ll talk about some actionable steps you can take in order to increase your business’s search ranking and get new customers. Online reviews are a great example of user-generated content that helps customers discover your business. They are filled with things that Google’s algorithm loves: fresh content, relevant keywords, images published on authoritative sites like Facebook, TripAdvisor, and Google itself. 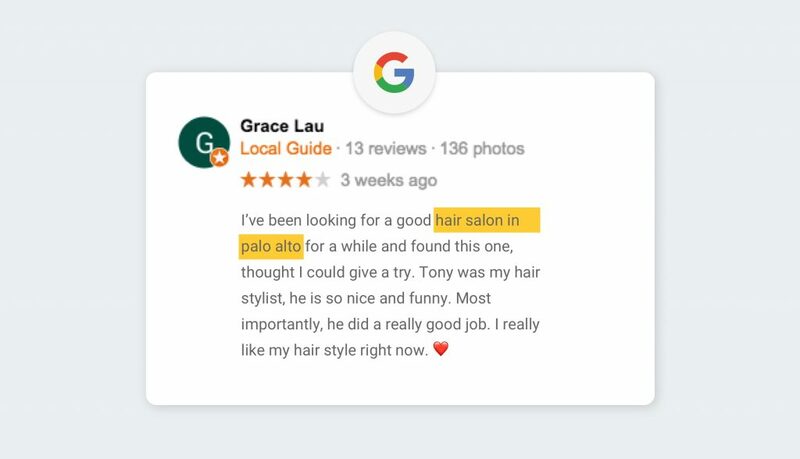 As you can see in the image below, customers will often use keywords in reviews that they used to discover your business. 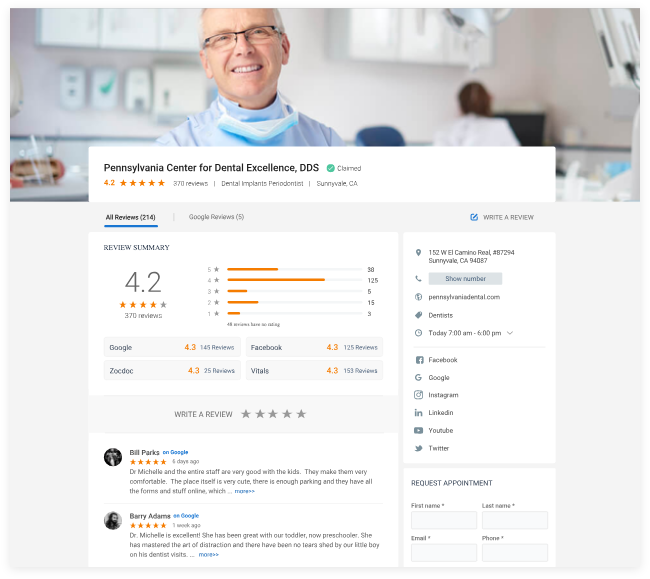 You can leverage these user-generated reviews to conduct keyword research. Looking at these reviews can often reveal how customers are finding your website. Imagine a dentist’s practice that gives root canal treatments. If his patients are choosing to write “RCT” instead of “root canal treatment”, there’s a good chance that they are searching for those keywords too. The dentist should consider switching his keywords to “RCT” on his page description. This simple adjustment can lead to a huge improvement in search relevance and ranking. Search engines love fresh, relevant content like user reviews. So why not bring them onto your website? Having a live review feed on your website also helps your business look more trustworthy to visitors. Just like sharing reviews on your social media pages, displaying review feeds on your website helps to show social proof. Visitors can see immediately how well your business is serving other customers. Using BirdEye’s review widget, you can copy paste a line of code and add a feed of reviews from all over the web on your website. Prospects are more likely to choose your business over competitors if they see evidence of your brand’s quality and reliability. An easy way to show off what you have to offer is to share the reviews of satisfied customers to your social media pages. 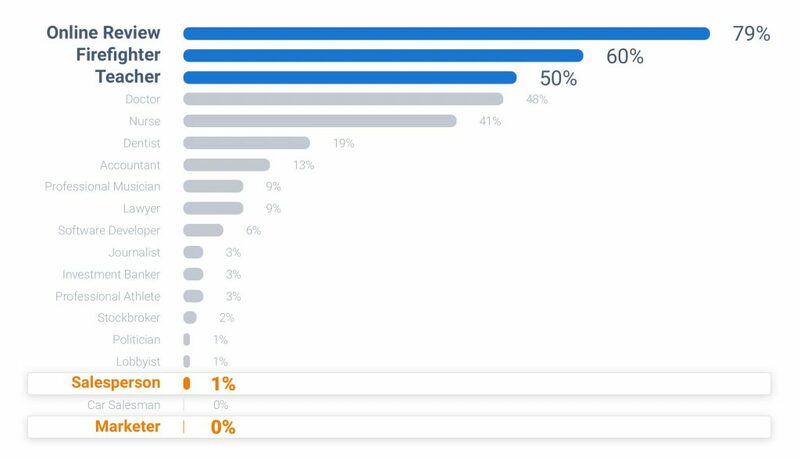 Again, customers aren’t the only ones paying attention to social mentions. 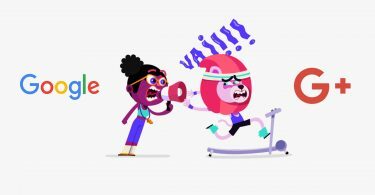 Soon, we may even see Google determine the popularity of your website by taking into account what people are saying about your business on social media and blogs. Remember, one of the factors that Google takes into account as part of review signals is review diversity. That means that your business should keep track of reviews on several different sites instead of focusing on just one. Keep track of review sites that cater to your specific industry. To do this, Google a term related to your industry. You can see a drop-down arrow to the right of relevant results. Click on this to see similar results (in this case review sites or top sites affiliated with auto repair in Dallas). Customers visiting these industry-specific sites are usually further along the path to purchase. They probably already know what they’re looking for, they are just deciding between a few different options. Just be sure that your business will be there to convert. This might seem obvious, but a study by Local Search Association showed that only 44% of businesses have claimed their Google My Business profile. Claim your Google My Business profile, then add accurate information and high-definition images. 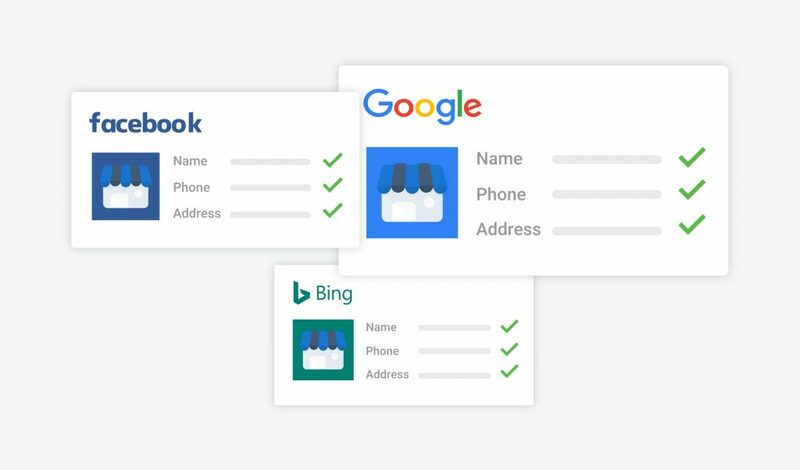 This will make your business more trustworthy in the eyes of Google’s algorithm. The more customers know about our business right away, the more likely they are to give you a click. Completing your profile will give customers and the information they need to trust your business. Google My Business isn’t the only profile you should claim. BirdEye builds custom, SEO-optimized profiles that display reviews aggregated from across the Internet. If enough review signals are met, you’ll see your business’s BirdEye page appear high in search results. When your website shows up on search engine results, the site title, URL, and meta description you’ve assigned to your page will be displayed. 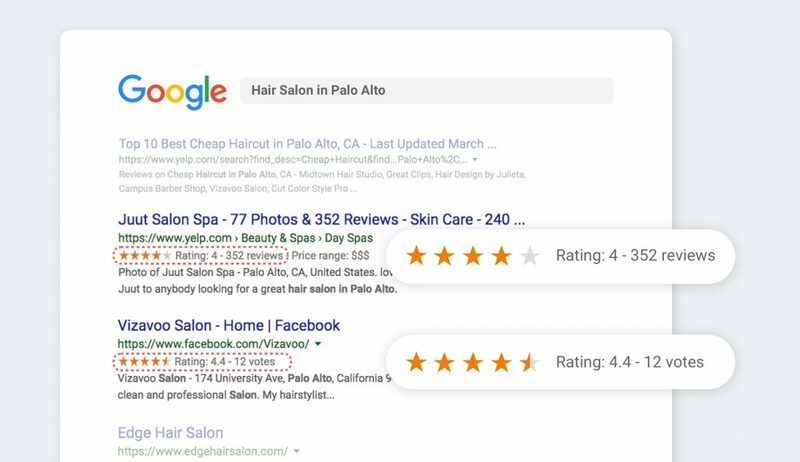 With rich snippets, you can add additional information such as review star ratings, review quantity, product details, photos, and images. Below you can see a search result without a rich snippet (on top) and a search result with a rich snippet (on bottom). As you can see, the search result on the bottom is more engaging and will likely get more clicks from customers. If all that sounds a little too complex for you, don’t worry. Services like BirdEye can take care of this process for you, embedding rich snippet data into your website’s code. You can enable Google Seller ratings on your business’s paid Google search ads. Google Seller ratings allow potential customers to see how your current customers are rating your product. Enabling these Google Seller ratings will make your Google AdWords campaigns more efficient. A higher click-through rate means a higher quality score, lower cost per click, and more customers. In order to enable Google Seller ratings, your business does have to meet certain requirements. Your business must have received at least 100 reviews from your country in the last 12 months and a composite rating of at least 3.5 stars. This review requirement is rolling. Your business will need 100 reviews for the last 12 months through the entire length of the campaign. In order to maintain Google seller ratings, you need to have a constant stream of new reviews. That makes it even more important to make sure that you are consistently soliciting reviews from customers. While review signals help Google determine local search ranking, it’s not the only factor that matters. Another significant factor is citation signals. Citation signals relate to your business having consistent listings on different websites. That includes your name, address, phone number and website. When search engines find conflicting or outdated listings on businesses on different websites, they find your business less trustworthy. That leads to a decline in your business’s search ranking and ultimately, a decline in the number of customers who find your business. Not having consistent business listings might even reduce your customer base. According to Brightlocal, 68% of customers said they would stop using a local business entirely if they found incorrect information online. This might sound simple, but there are hundreds of review sites across the Internet. Every single detail counts, including the formatting and abbreviation of streets. Luckily there’s a solution to this problem. Use an online listings tool to fix these details and increase your online visibility. BirdEye supports businesses on every step of the journey from reviews to revenue. Our all-in-one platform allows you to get new reviews, embed rich snippets, manage your social accounts, and maintain a positive online presence. More than 50,000 businesses use BirdEye to drive growth and get new customers. Click here to see what BirdEye can do for you. Be found online. Get new customers.